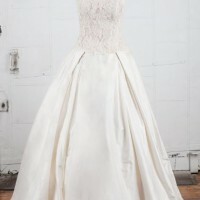 Purchased at Bleubelle Bridal Boutique in Savannah, GA.
No alterations to the length, I am a true 4 "street size," Bust 34", Waist 26", and added 3 feet of length to the train. Ball gown silhouette, sweetheart neckline, worn ONCE in 2015, silk fabric, court train, strapless. 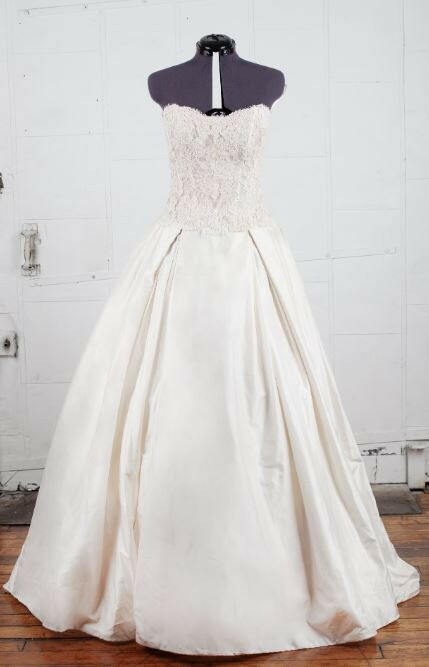 The dress was professionally cleaned and preserved right after the wedding in October of 2015. It was just recently opened and professionally dry cleaned again. Once you send a message, Jamison can invite you to purchase the dress.